Asian Cricket Council Youth U19 Asia Cup 2016 match schedule, fixture and time table. 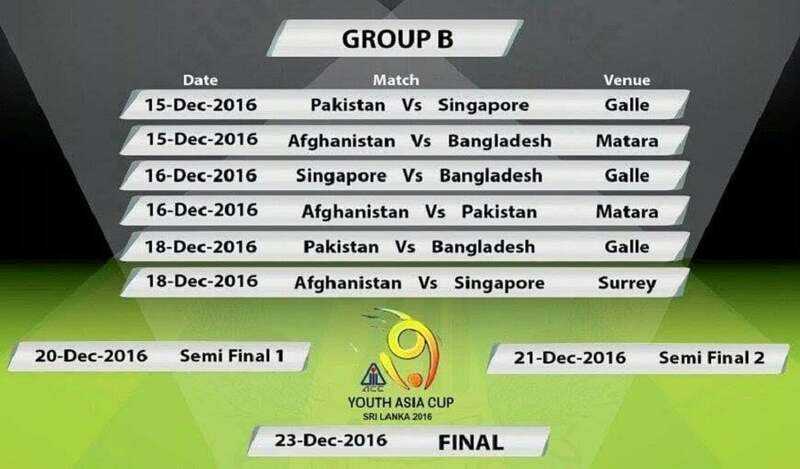 Under 19 Asia Cup 2016 match schedule. The tournament will start on 15 December in Sri Lanka. There are total eight team will play by divided two group. 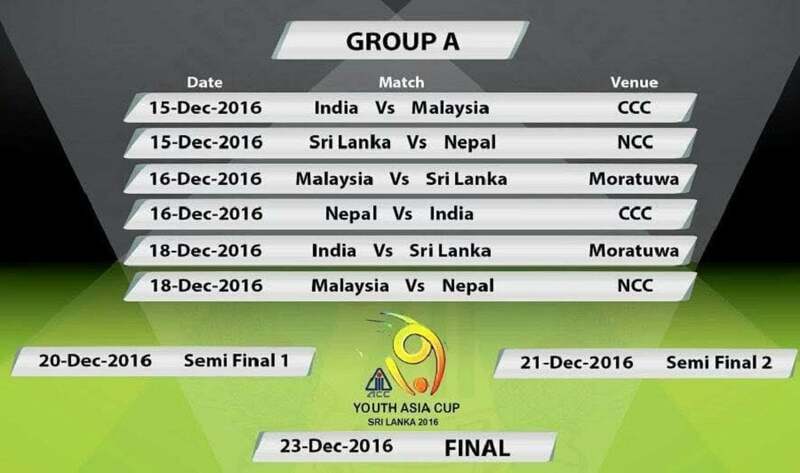 Four team in Group A and four team group B. U19 Youth Asia Cup 2016 grand final will be played on 23 December. Bellow you have to see the U19 Asia Cup match schedule, Bangladeshi Time and India Time table, All team squad and player list. Also the points table as well. Venues : Teams in Group A will play their games in Colombo, with matches being hosted at Colombo Cricket Club, Nondescripts Cricket Club and Moratuwa Stadium. Teams from Group B will play further down south in Galle, Matara and Surrey Village Ground. Pakistan U19 Team Squad : Nasir Nawaz (Captain), Mohammad Mohsin Khan, Abdullah Shafiq, Ali Zaryab (Vice-Captain), Zahid Alam, Muhammad Arif, Waqar Ahmed, Saad Khan, Hidayatullah (Wicketkeeper), Shaheen Shah, Muhammad Husnain, Moosa Khan, Ibrar Zaman, Umar Khan and Mansoor Ali. Afghanistan U19Team Squad : Naveen-ul-Haq (c), Shamsurrahman (vc), Darwish Rasooli, Ikram Faizi, Imran Mohammadi, Mujeeb, Naveed Obaid, Nisar Wahdat, Parwiz, Qais Ahmad, Rohed Janzai, Tariq Stanikzai, Yousuf Zazai, Zahidullah, Zahir Khan. Singapore U19 Team Squad : Janak Prakash (c), Aahan Gopinath Achar, Aman Desai, Anirudh Harikrishnan, Ansh Bhargava, Aryan Kiran Badhe, Aryaman Sunil, Avi Dixit, Bikram Bir Biswaray, Brigu Iyer, Hanshul Deep, Rohan Rangarajan, Chetan Suryawanshi. India U19 Team Squad: Abhishek Sharma, Rahul Chahar, Harvik Desai, Priyam Garg, Ayush Jamwal, Salman Khan, Kamlesh Nagarkoti, Het Patel, Himanshu Rana, Prithvi Shaw, Shiva Singh, Shubman Gill, Yash Thakur. Sri Lanka U19 Team Squad : Ashen Bandara, Hasitha Boyagoda, Vishva Chathuranga, Lasith Croospulle, Jehan Daniel, Praveen Jayawickrama, R Kelly, Kamindu Mendis, Thilan Prasan, Nipun Ransika, Wanitha Wanninayaka, Hareen Weerasingha. Malaysia U19 Team Squad : Ahmad Zaim, Ainool Haqqiem, Arjoon Thillanathan, Fadli Haris, Islah Zol, Muhammad Amir, Muhammad Hafiz, Muhammad Hashim, Muhammad Hasif, Muhd Naim, Suresh Navaratnam, Solihin Rusli, Syed Aziz, Zubaidi Zulkifle. Nepal U19 Team Squad : Sandeep Lamichhane (C), Mohammed Asif Sheikh, Sandeep Sunar, Dipendra Singh Airee, Rabindra Jung Shahi, Bhim Sharki, Aadil Khan, Anil Kumar Sah, Suwarnakar Uraw, Pawan Sarraf, Kamal Singh Airee, Prakash KC Abhinash Karn, Nandan Yadav, Rohit Kumar Paudel.